Florence passed peacefully on January 4, 2018 at the Kamloops Hospice after a brief battle with Cancer. 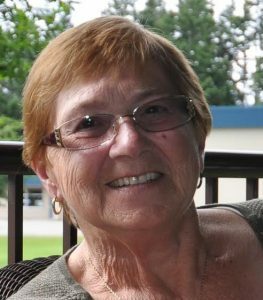 Florence was born July 14, 1945 in Elk Point Alberta the daughter of Eric and Zelma Nettleton. Florence enjoyed athletics throughout school and decided early on to enter the work force and left home to work in Northern Alberta where she met the love of her life, Al. In 1966, Florence and Al married and soon after began to raise their two daughters together. Florence spent most of her working years in Princeton BC working in wood preserving industry where she spent 27 years. In retirement Florence and Al travelled extensively living out their dream of seeing new places and experiencing new things. A move to Kamloops allowed Florence the opportunity to spend more time with her daughters and granddaughter. Florence is survived by her loving husband of 51 years Al, daughter Lori Moshuk daughter Lana Moshuk, the treasure and light of her life, granddaughter Morgan Rossi who was a cherished gift, her niece Rhonda Parsons and nephew Rick Axani and her mother-in-law Annie Moshuk. Florence will be dearly missed by her family, friends and all who knew her – she was a caring, loving, fun and warm-hearted person, always there for anyone who needed her. There will be a celebration of life Thursday, January 11, 2018 at 11:00 at the Coast Hotel in Kamloops, 1250 Rogers Way. A graveside service will follow at the Kamloops Cemetery. In lieu of flowers, memorial donations can be sent in her name to Kamloops Hospice Association, 72 Whiteshield Cres South, Kamloops BC V2E 2S9. Florence was a very kind & caring lady, also a good neighbour. Thinking of u all with sincere sympathy. We were so saddened by the news that Florence had passed. Florence was a great lady, fun loving, caring and a wonderful person to call friend. She will certainly be missed by so many but mostly by the family who loved her so much. Our deepest sympathy to all of you. Your memories will keep her alive in your hearts always. Al, Lori, Lana & Morgan our heartfelt condolence to you. We will miss our freind Flo so much. She was a great friend fun and just a ray of sunshine. wonderful memories.wishing you all peace and comfort. Shocked & saddened by your recent great loss. Much sympathy from us. So sorry to hear of Florence’s passing, but I feel so fortunate to have gotten to know her. Visiting both of you on the farm in Hylo is something I will always miss. My sympathy to all of you. Al, sincere sympathy is extended to you and your family. It was a privilege to meet both you and Florence only this fall in Kelowna. Recognizing your loss and heartbreak. Our deepest sympathy to you and your family, Al. We were so fortunate to have known Florence and enjoyed her wonderful personality when you came out to Hylo. She touched many lives in such a positive way. Sending our thoughts and love to you, our hearts are heavy with the loss of our special friend, your loving wife, Mom, Grandma, Aunt and friend to many. . She will be missed so much by you and the girls as you are all so closely knit together and by all who have ever had the luck and privilege to know her and spend time with her. Our hearts go out to you in the loss of your wife, mother, and grandmother. We were so lucky to have the gift of her friendship through all these years. We have many special memories of time spent with her and with all of you. We shall cherish those memories always. I am truly sorry to hear of Florence’s passing and send my condolences to you. It is with heavy hearts we are sending you our deepest condolences Al and family. We only met Florence a few times but we really enjoyed visiting with her. She was a wonderful lady. We are very sorry for your loss. So many memories, Grad, Dry Lake, Florence was always there laughing, having fun and poking fun with/at us. Although I didn’t know Florence for long, we met only in 2015 on Salt Spring Island, where she and Al were living next door to a good friend. I felt I had known Flo and Al for many years. Her warm smile and gentle voice made me feel welcome and right at home! And in 2016 when driving across Canada with my daughter, Amanda, we stopped for a visit in Kamloops; there again, we were made welcome and we felt right at home in their beautiful new house overlooking the valley. I will miss Flo and reading her posts on Facebook, they were always about love, daughters & grandchildren…Florence touched me greatly and I know she will be sorely missed. Al, my heart goes out to you and your daughters. It’s with great sorrow that we learned about Flo’s passing. Al was an auntie to me. She was a straight shooter and never bs’d. I admired her integrity and her good heart. I will also fondly remember being invited to meals and to just sit and chat about everything and anything. What a big support she was to me, I hope that I can return the favor as I send thoughts and prayers to you and your family Al. We are sorry for your loss of Florence. It was a pleasure to have known her. She was a lovely lady who was quick to smile, laugh, and share stories of many adventures. We always had enjoyable visits on the farm in Hylo. She will be missed. Our sincere condolences. Al, Lori, Lana, and Morgan. Florence was loved by so many people! This could only be because she offered love to everyone she encountered. No doubt to her family most of all! Her generous and fun nature was a gift our family was blessed to experience. How grateful we are to have shared in her quick wit, smiles and laughter. She will always be one of a kind, and remain a precious part of our memories and family. Our most sincere condolences to you all. We hope you might find solace in friends and family at this time. Al, Lori, Lani and Morgan, my sincere sympathies to all the family. I was very privileged and got to tell Cousin Florence how much I loved her and got to say one final goodbye . She fought a hard battle to the end with courage and determination. Till we meet again I hope you have a safe journey, rest peacefully now. Our hearts go out to you Al ,Lori ,Lana and Morgan. Florence was a very special friend. We had many good times together over many years. We watched you girls grow up and your mother was so very proud of you, as she should be. We will certainly miss her she can never be replaced but we will remember the good times we had. A true friend is gone. Our thoughts and prayers are with you AL, Lori and Lana. The memories are cherished. There is so much more to say. Thinking of you all. Hugs. We know your mom will be greatly missed by her family and friends; your memories of her will stay with you always and will help you find peace in the days ahead. On behalf of our Finning Retirees Association – we would like to express our deepest Sympathy to Al and his Family.